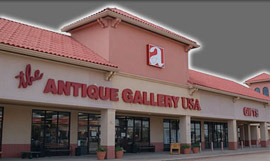 Antique Gallery of Denton features a large selection of American & European antiques as well as a complete line of Western home decor furniture & art. We offer oriental & Persian rugs, costume and estate jewelry, rare coins & knives. We have the area’s largest collection of Fenton Art Glass and offer a large selection of gifts from Willow Tree, Circle E & Designer Floral Selection.